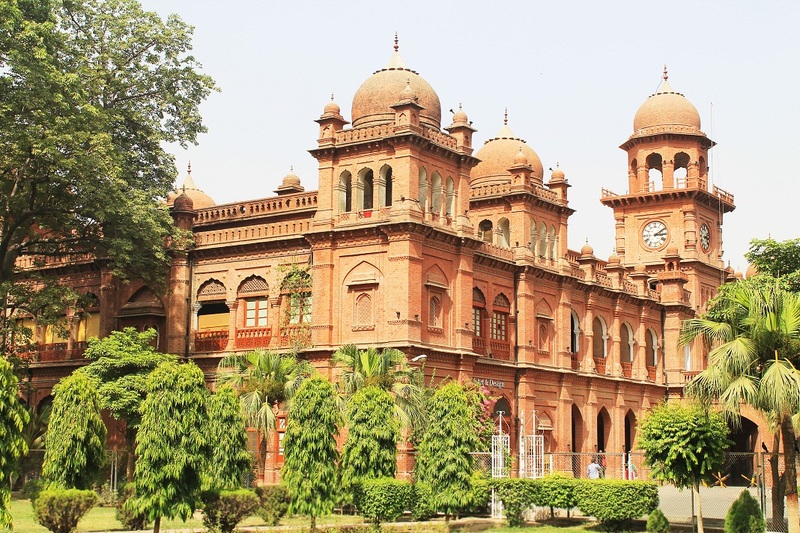 LAHORE: Punjab University (PU) will be ending contracts of as many as 500 teachers and other staff members in reaction to the instructions issued by Higher Education Department (HED) to ensure appointments through newspaper ads, Pakistan Today learned on Saturday. According to reports, over 500 PU employees, including teachers and non-teaching staff, will lose their contractual jobs. Some of these employees have served the varsity for almost 12 years while working on contract-basis, sources said. 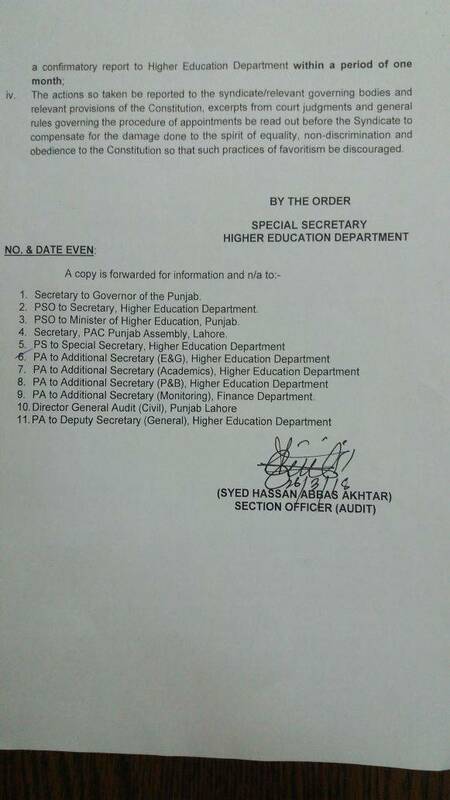 A letter, available with Pakistan Today, issued by the HED to all public-sector universities in Punjab conveyed the concerns of Public Accounts Committee pertaining to appointments without newspaper advertisements. Finding it a violation of articles 25 and 27 of the Constitution, the HED ordered all public-sector universities, including PU, to implement the necessary rules and regulations of the recruitment process. The department has directed all varsities to strictly follow the condition of newspaper ad copies for the issuance of pay slip after every new appointment. 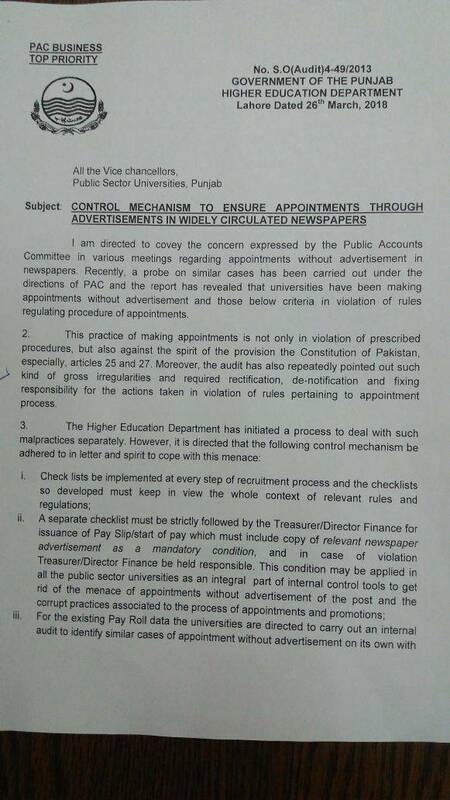 Moreover, the department has ordered the government-run universities to conduct an internal audit and identify all appointments without the advertisements in widely-circulated newspapers. The universities will have to submit a confirmatory report to the HED within one-month period. HED said the move was taken to ensure “equality, non-discrimination and obedience to the Constitution” by which “practices of favouritism” can be discouraged. While talking to Pakistan Today, PU spokesperson Khurram Shehzad confirmed that the decision was taken by the HED under the article 25 and 27 of the Constitution, adding that the move would not affect any permanent employee. He stated that the universities would now fill up their vacancies only through newspaper ads.